Just got a Mad Modder DNA250c with an Aromamizer Plus and single SS316 coil. What's happening is half the time when I go to vape, even when cold, the mod will stop firing and show "throttled" on the screen. If I let go of the firing button and hit it again right after, I get a full power vape. Coil isn't dry or anything. Anyone know why this is happening? Here you go. The coil was warm this time, but it still happened. The vape about 30 seconds earlier was totally normal. 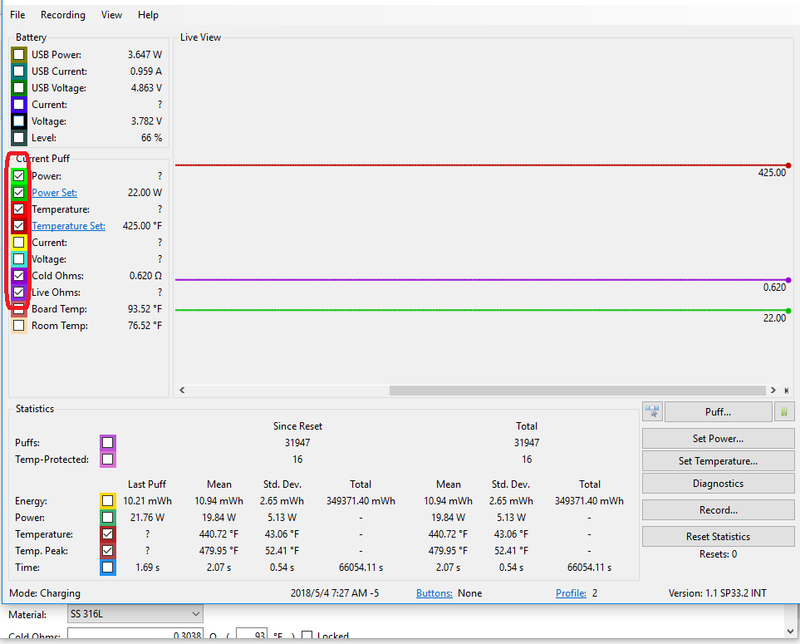 Unless I'm missing something it looks like you are reaching the set temp quickly and the power throttles down to maintain the set temp.... What happens when you set the power down to 60 watts? I think we're both missing something. 75% of the time, everything is perfectly fine. Mod fires, gives me a full vape, no issues at all. About 25% of the time, I'll get a hit for about half a second, and then nothing at all. This is when the "throttling" message shows up on the screen. A normal hit also shows the power varying to keep the temperature, but it's working. When the throttling happens, it goes dead. I have been using this atty on first a Reuleaux, then two Triade DNA250s with no issues. Weird that it would show up on this new mod all of a sudden I think. Not really, I have had tanks that just refused to vape on a certain mod. Mainly tanks that were other than stainless steel. Seems the coloring/paint would cause all my VT133s to fail, but worked fine on my VT167s and other mods. Doesn't really help in your case, just to let you know that it can indeed be related to the tank even if it works elsewhere. Really? That seems strange. Although I suppose in a way it makes sense. In any case, it's more of an annoyance than an actual problem. Just didn't know if there was something I could test. Considering getting the Aromamizer Titan just to see if it helps. Otherwise, I'm loving the mod and the chip. I like having a lot more control over it from the mod itself rather than depending on escribe. Can't speak for the Titan, but I love my Supremes, Supreme V2s, and Pluses. Yeah this Aromamizer Plus has been amazing on everything else. But if it has this problem with this mod, it's kinda pointless. I don't think it's coated at all. The deck and 510 look like straight metal to me. Just for fun, since it isn't doing productive work right now. Take a small screwdriver and tighten the screw in the 510 pin on the Plus. I have several tanks come to me with that screw a wee bit loose and it cause all sorts of grief until as a last resort I tried tightening it. Now, it's part of getting a new tank. I'd also spin me a new set of coils and perhaps replace the grub screws. If none of that produces results, go ask Maggie Luo at Steamcrave for a replacement base. They have been really good with replacement parts for me over the years. Well yes, I figured that's what it meant, but it's not accurate. Like I said, it works most of the time perfectly fine, and occasionally will get that message with a completely cold vape. So perhaps the posters problem is related to one of those other errors. I vape TC all the time, I’m sure I’ve hit my temperature, but have NEVER seen a TP message on my color mod. It's either a wandering base resistance, shorting coil wraps, or a sporadic loose connection somewhere. EScribe's Atomizer Analyzer will show if there is any instability in resistance. Have you calibrated the "mod resistance" yet? Using a copper 510 threaded plug. Took it all apart and cleaned it up in an agitator, pulsed the coil 15-20 times in wattage mode and saw no hot spots or anything. Cleaned up the coil, replaced the grub screws and put it all back together. It's now happening more than it was before. Getting pretty frustrating. I'll try replacing the coil tomorrow, although it's a brand new coil. Have not done the copper plug. Never have in any mod actually. Just screw your aromamizer (room temp) down onto the mod, open EScribe, open Atomizer Analyzer and watch the "RAW OHMS" a solid connection will not fluctuate more than 0.001 - 0.003 ohms. Try slightly rocking the atty (while still tightened down on mod) (see if torquing down the atty onto the mod lowers the raw ohm readout.) (play around with tightening atty wire post screws, while watching raw ohms). Stability is a must with Replay or TC. Without it, you might as well just use VW. Also, the 510 positive post screw in the atty needs to be clean and tight. The 510 threading. The mod's 510 threads and positive pin also needs to be clean. I regularly use 99% iso alcohol to clean any connections. So, I'v seen this happen on one of my 250c's with a Plus on top also. I'm running 2 exact same setups 250c 1500mAH lipo, Evolv 510's, with Supreme Plus's, on single SS430 Claptons. Only one of the 2 would give the "Throttling" every once & a while, not very frequent. It was very random & would only happen for a small amount of time, then go back to normal. I to have used the Supreme Plus's in TC for ever now & have never had connectivity issues ever! I was only getting this with a certain "Theme" "Gauges" on only one of 2 exact setups. I have since changed themes & have yet to see the "Throttling" message since? The frequency of it was so little, that I didn't bother posting. Heck I had forgot all about it till I seen this thread. Are you using the "Gauges" Theme?